Josh Atkins is an eleven year old kid who dreams of being an intergalactic game fighter. A superhero. Protector of the universe. But there’s not much chance of that. In reality, Josh sees himself as a goof ball. A geek. One day, Josh reads an advert: Wanted Super Space Kids to save the galaxy. He can’t believe his eyes. This is his dream come through, his big chance to zoom off into space. That is, if he can win the contest. Soon, Josh (aka Jo-Kin) is off to Space School for special training. He’s teamed up with Sam Jones (aka Sam-Wich). Jo and Sam have to learn to work as a team. Their training is a disaster. Jo and Sam fail again and again. Sam wants to give up and go home. Jo tries to convince Sam to stay at Space School. Then they hear the terrible news. A deadly alien called the It has kidnapped Captain Astra. Sam definitely wants to go home! But someone has to blast off into space, rescue Captain Astra and save the galaxy from the terrifying It. That someone turns out to be Jo and Sam. This time the training is for real and failing is not an option – if they want to survive. 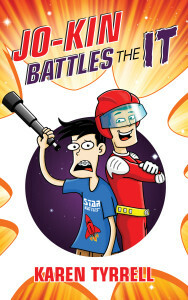 Jo-Kin Battles the It is out of this world – perfect for middle grade readers aged 7 to 10 years. The story is action-packed and fast-paced. The characters are likable (except for the It, of course, who is very scary). Kids will love the adventure which is sometimes fun and sometimes full of danger, suspense and ugly aliens. Jo-Kin Battles the It is the latest release from award-winning author-teacher Karen Tyrrell. Not only is this book a great read, the story also deals with important topics such as team work, resilience, self-esteem and friendship. The book is kid-friendly with its bright, colorful cover, black and white illustrations and appealing internal design. Whether the kids are superheroes or geeks, the story will keep them turning the pages until, at the end, they will be left wanting more. 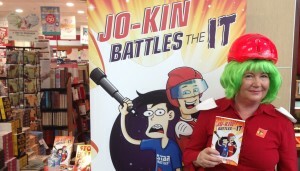 Jo-Kin Battles the It is also available on LSI, library services and selected stores including some Dymocks and Angus & Robertson. To WIN please LIKE Karen’s Super Space Kids book series page on Facebook https://www.facebook.com/SuperSpaceKids and Leave a comment on any of the below Blog stops 19-31 Oct to win. Good luck.